Canara Bank Recruitment 2018: Application process for the recruitment of candidates against 800 Probationary Officer vacancies is soon going to be closed on the official website. Candidates are advised to log into the website canarabank.com and submit their applications apply asap. 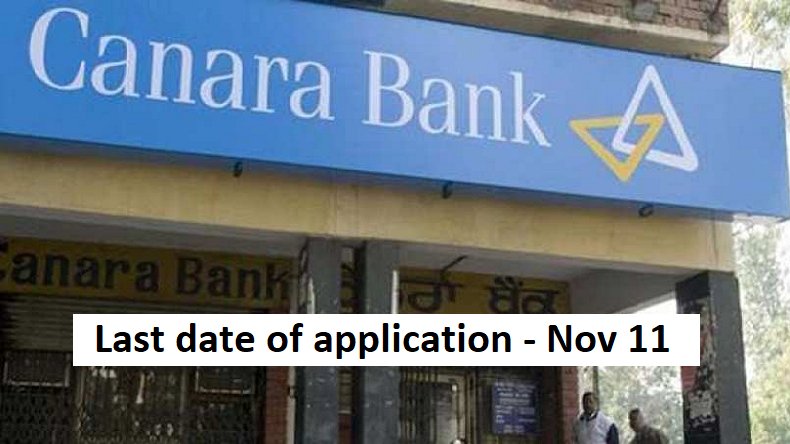 Canara Bank Recruitment 2018: Canara Bank had recently released a notification for recruitment of Probationary Officers through the official website and as per latest updates, the application process if all set to be closed on the website of Canara Bank soon. Candidates who have not yet applied for the posts can check the notification online and log in to the official website to apply online. The application can be accessed on the official website – www.canarabank.com. According to reports, the application process for the Probationary Officers recruitment will be closed a day after tomorrow i.e.on November 13, 2018. Moreover, the candidates who are interested to apply for the posts must note that they have to go through a one-year training course in Post Graduate Diploma in Banking and Finance (PGDBF) and 3 months internship at various branches/offices of the Canara Bank. The candidates will be selected on basis of their performance in the written examination to be conducted by the Bank which will be followed by a Group Discussion and Personal Interview. All the applicants must note that there are 800 vacant posts and it is mandatory to fulfill all the criteria for being eligible to apply. The candidates must be in between the age of 20 to 30 years as on the last date for submission of application. It has been learned that the online application process was opened on October 23, 2018. Reports say that the Admit Cards for the written test or Online test will also be released on the official website of the Canara Bank soon and the tentative date for the same is December 5, 2018.